Terms - Entera Health, Inc.
Entera Health’s websites and their information, materials and functions (“Contents”) are designed to comply with laws and regulations of the United States (the “U.S.”). Although accessible by others, the websites and their Contents are intended for access and use by U.S. residents only. Entera Health makes no representation that the Contents of its websites are appropriate for use in any other jurisdiction. If you choose to access the websites from other locations, you do so on your own initiative and are responsible for compliance with applicable local laws and regulations. The Contents may, from time to time, contain information relating to various medical conditions, treatments and medications. This website does not purport to provide you with medical advice of any kind whatsoever. You are advised to consult a physician or other medical professional for advice regarding any medical condition or treatment thereof. Unless otherwise noted, product names, descriptions and labeling are of U.S. origin. Products may not be available in all countries or may be available under a different name, in different strengths, or for different indications. Many of the products listed are available only by prescription through your local healthcare professional. 1. You may browse Entera Health’s websites and download their Contents. You may use downloaded Contents only for personal, noncommercial use. You may not distribute, modify, transmit, reuse, repost, further modify or use in any other manner any of the Contents for any other purpose whatsoever, without the express written permission of Entera Health, Inc. All copyright and other proprietary notices contained in any downloaded Contents must be retained. 2. The Contents are copyrighted unless otherwise noted and may not be used except as provided herein and without the express written permission of Entera Health. 4. Your use of Entera Health’s websites is at your own risk. The Contents contained in these websites, including text, graphics, links or other items, are provided on an “as is” basis without warranties of any kind, either express or implied, including but not limited to warranties of merchantability, fitness for a particular purpose, noninfringement or freedom from computer virus. Entera Health does not warrant the adequacy, currency, accuracy or completeness of the information and materials included in its websites or in third-party sites linked to or from this website or that the functions provided will be uninterrupted or error-free and expressly disclaims any obligation to update the Contents. Entera Health expressly disclaims any liability for any errors or omissions in the Contents included in its websites or any third-party sites linked to or from this website. Please note that some jurisdictions may not allow the exclusion of implied warranties, so some of the above exclusions may not apply to you. Check your local laws for any restrictions or limitations regarding the exclusion of implied warranties. 5. In no event will Entera Health be liable for any direct or indirect, special, incidental, consequential or punitive damages, lost profits, or other damages whatsoever arising in connection with the use of its websites or their Contents, any interruption in availability of the websites, delay in operation or transmission, computer virus, loss of data, or use, misuse, reliance, review, manipulation, or other utilization in any manner whatsoever of the websites or their Contents, even if Entera Health has been advised of the possibility of such damages or loss. 6. Any communication, information or material that you transmit to the websites by electronic mail or otherwise, including any data, questions, comments, suggestions or the like, is, and will be treated as, nonconfidential and nonproprietary information and will become and remain the property of Entera Health. Entera Health, or any of its affiliates, may use such communication, information or material for any purpose whatsoever, including, but not limited to, reproduction, disclosure, transmission, publication, broadcast and further posting. Further, Entera Health and its affiliates are free to use any ideas, concepts, know-how or techniques contained in any communication, information or material you send to the websites for any purpose whatsoever, including, but not limited to, developing, manufacturing and marketing products. 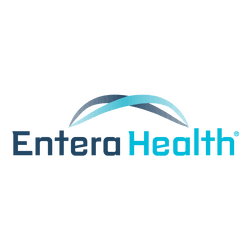 Entera Health will not be subject to any obligations of confidentiality regarding submitted information except as agreed to by Entera Health, specifically stated on the websites or as otherwise specifically agreed to or required by law. 8. Entera Health will retain all right, title and interest in and to its websites and the Contents and all intellectual property rights therein or attached thereto under any applicable body of law. Nothing herein shall be construed as a license to you under any Company patent, trademark, copyright or trade secret. No title or ownership rights are transferred to you under this Agreement. You shall not, nor shall you authorize any third party to, (i) create derivative works, or alter in any way, the Site or the Content or (ii) use the Site or the Content other than as expressly discussed herein. 9. You are solely responsible for providing all hardware, telecommunications equipment, software (including browsers) and bandwidth that you require to access the websites and the Contents. You are also responsible for providing your own access to the Internet and paying all telephone or other fees associated with such Internet access. 10. Entera Health has not reviewed all of the sites that may be linked to its websites and is not responsible for the content of any off-site pages or any other sites linked to its websites. Your linking to any other off-site pages or other sites is at your own risk. 11. Entera Health reserves the right to alter or delete material from its websites or the Contents at any time. 14. Your access to and use of this website under these terms are governed by and will be construed in accordance with the law of the State of Iowa without regard to principles of conflicts of laws. In the event any provision of these terms is held unenforceable, it will not affect the validity or enforceability of the remaining provisions and will be replaced by an enforceable provision that comes closest to the intention underlying the unenforceable provision.